Experience the exotic! Established in 2006, our Honolulu, Century Center location provides licensed professional service in rooms with comforting ambiance, harmoniously combining traditional Thai atmosphere with modern architecture and incredible views. All your moments will be filled with affinity, safety and relaxation all espousing Thai-cultural hospitalities. Find complete serenity in one of our specialized spa packages, such as Touch of the Angel or Sabai Sabai or request your own. Our courteous, professional therapists will indulge your senses while invigorating your body into a state of serene tranquility in our facilities. Siam Thai’s strength lies in our full staff of dedicated and professional massage therapists with formal training at renowned institutions, including the Wat Po Center in Thailand as well as other top institutions around the globe. Born and raised in Thailand, Tanya received training and is certified by the world famous Wat Po Thai Traditional Medical Services Society in Klongluang Pathumhani, Thailand. She is now licensed in Hawaii and possesses over 6 years experience in massage therapy. Tanya’s holistic Thai massage also includes swedish, Deep tissue and Lomi Lomi. 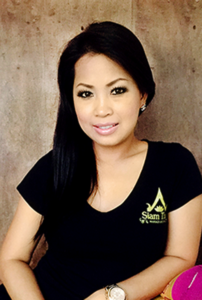 Tanya has a unique way of nurturing her clients specific needs and would like to welcome you to Siam Thai Massage and Spa.